DinoTigermon is an Ancient Beast Digimon and a carrier of the X-Antibody Factor : DinoTigermon in its Digicore. 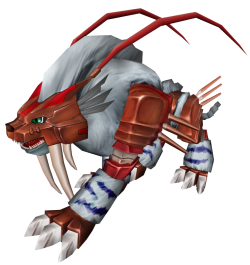 It resembles a half robot, half smilodon Digimon with light blue fur and darker blue stripes. It is a rare and extremely unusual Digimon. DinoTigermon (X-Antibody System) was added to Korean Digimon Masters on August 08th, 2018. DinoTigermon (X-Antibody System) was added to Global Digimon Masters with the August 28, 2018 Patch. Highland Fang Steel attribute 3 seconds cooldown 55 DS consumed skill points per upgrade Learned at Lv. Continuously strikes the opponent with its forelegs. Ground Fang Steel attribute 8 seconds cooldown 161 DS consumed skill points per upgrade Learned at Lv. Presses down on the opponent with its forelegs and bites the opponent with the fangs. This page was last modified on 21 April 2019, at 20:40.